After spending three months up North while our street food business Slap & Pickle was trading at Leeds’ Trinity Kitchen, we were understandably devastated to be heading back down the A1. “We’ll forget all about Leeds once we’re back in Essex,” was the wholly unconvincing sentiment we tried repeatedly to believe as our transit van took us ever further away from a city we already had a not-insignificant inkling was The One. That was March 2018. Two months later, we were well and truly wedded to the city that had wooed us so well; finalising the purchase of the first home either of us had ever owned, together or apart. Summer saw us popping up at various food events, serving our loaded fries and diner food at the likes of Eat North and Chow Down. And now we’re opening our first permanent site within spanking-new Leeds food and drink mecca Assembly Underground. It all sounds like pretty linear progression. But, as with most things in life, the journey to get to this point was riddled with diversions, obstacles, and a fair bit of getting lost on the way. You know that Human League song that starts ‘you were working as a waitress in a cocktail bar, when I met you’? Well, James wasn’t serving drinks when we met, but he did approach me wearing an usherette tray. I was a glossy magazine editor, he was a street food veteran hosting a brand launch where the staid parent company wanted a bit of his ‘edgy cool’. I evidently wanted a bit of it, too. And I got it. A lot happened in our first year together, rendering it equal parts wonderful and awful, easy and impossible, fairytale and nightmare. But we weathered it. Then British Street Food founder Richard Johnson offered James a spot in Trinity Kitchen – a space which hosts a regularly-changing line-up of food traders. As my editor’s job could be done remotely, I went with him. My supposed ‘occasional shifts’ ended up as a full-on baptism of fire – one which stood us in good stead when the magazine folded. I was redundant, yes, but also newly-trained in co-running the show. Slap & Pickle became our joint food baby. Running a small business is not easy. Given the current political climate, it doesn’t look like it’s going to get any easier. And running one with someone who is your partner romantically as well as in business adds its own challenges to the mix. But our skills are pretty complimentary, meaning Slap & Pickle has most bases covered. I’m communications and creative development, James is logistics and basically the one who ‘gets stuff done’ (hence me buying him a pair of socks bearing the statement ‘busy making a f***ing difference’). 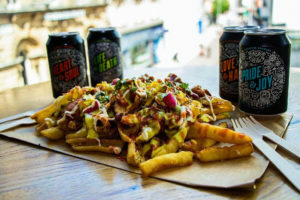 At Assembly, Slap & Pickle offers all sorts of off-the-wall loaded fries and perfectly-executed, gimmick-free burgers which we reckon are the best in Leeds. If you’re just in the market for great food served by smiley, happy people, you’ll get it every time. But there’s a bit more to what we do, too. Owing to various life experiences, mental health is a cause that’s very close to our hearts. We’re a bit over the whole ‘raising awareness’ stuff because Britain’s got itself to a place where awareness is abundant; it’s resources and support that are lacking. So, for Slap & Pickle, it’s about effecting practical change: getting employees Mental Health First Aid-trained, donating time and money to relevant charities, letting customers know that we can signpost them to the right help if they need it. We’ll also be implementing a programme of workshops and events at Assembly to promote the importance of self-care and taking responsibility for your own positive mental wellbeing. Making these things part of the way we operate hopefully helps others, and definitely helps us to stay on track. We don’t know if we’ll ever be accepted as honorary Northerners, but we’re delighted to be up here. 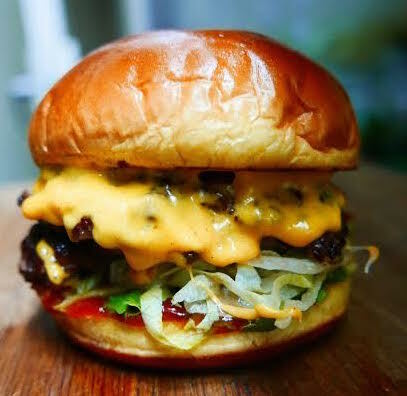 And we reckon the burgers, vibes and loaded fries we’re offering Leeds will go a fair way towards pleading our case. Assembly Underground opens on November 30, 2018 in the basement of the Grade II listed former Leeds School Board building following a £2.5 million refurbishment of the entire site. 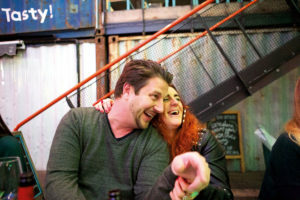 The permanent streetwise food, drink and entertainment space is already home to a number of food and drink outlets with more to follow.